HALLANDALE BEACH, Fla. - A Brightline train struck a car stopped on the railroad tracks Wednesday morning in Hallandale Beach. The crash was reported shortly after 7 a.m. at Pembroke Road and North Dixie Highway. Hallandale Beach Fire Rescue Chief Mark Ellis said nobody was in the car at the time of the crash. Local 10 News learned the driver, identified as Margarita Hall, accidentally turned onto the railroad tracks, thinking it was a street. She then couldn't move the car because the tires were stuck on the tracks. "She was smart," Ellis said. "She called 911." Hall was on the phone with 911 when the dispatcher warned her that a train was approaching. There were 28 passengers on the train at the time, but they were not hurt. Surveillance video obtained by Local 10 News shows the train dragging the car along the tracks as it comes to a stop. The train pushed the car about 500 feet. "Cars stand no chance," Ellis said. "It's the equivalent of a semi-truck running over a can." Brightline is a high-speed passenger rail service with stops in West Palm Beach, Fort Lauderdale and Miami. "We do see the trains coming at much greater speeds than what the trains used to come through at, and that's what, I think, catches driver's off guard, because the trains are very quiet and they come through very fast," Ellis said. A spokeswoman for Brightline said service was briefly interrupted but is operating as normal. 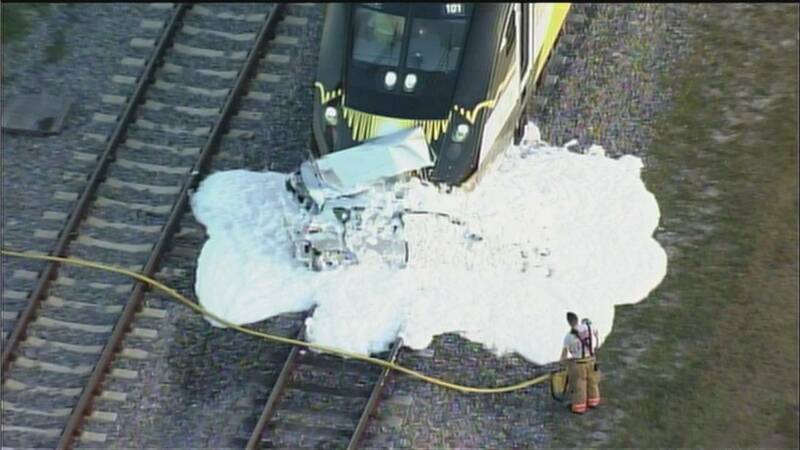 Foam covers a car that was struck by a Brightline train on the railroad tracks in Hallandale Beach.